Here's an interesting and very short story about those days and education from an old Indiana textbook called History Stories for Primary Grades by John W. Wayland, Ph.D. Doctor Wayland's credentials are given on the book's title page as "Professor of History and Social Science, State Teachers College, Harrisonburg, Virginia Author of HOW TO TEACH AMERICAN HISTORY." An online article from the Rockingham, VA schools tells much more. That state teachers college went by various names: State Normal School in Harrisonburg, Virginia which later became Madison University. I always love that name of "Normal" for a teachers college. It meant students were taught the "norms" of what was expected. Doctor Wayland was one of their first faculty, later the department head for History and Social Science and taught at other universities and Bridgewater College. He wrote about thirty books and, surprisingly, the lyrics to the song, "Old Virginia." 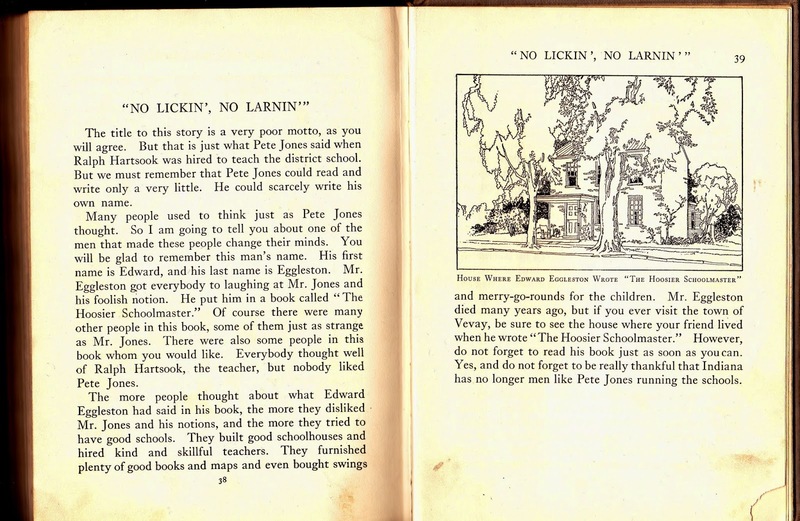 The actual story, "No Lickin', No Larnin'" talks about the adult novel by Edward Eggleston, The Hoosier Schoolmaster, based upon the Indiana rural teaching experiences of his brother, George Cary Eggleston. He wrote other books, both for adults and children, including a popular children's book called The Hoosier Schoolboy. Each can be found at Project Gutenberg along with others of his works. As revealed in the subtitle, "A Story of Backwoods Life in Indiana", these give a good look at rural schools of the 19th century with both humor and the dialect of the Indiana area. It's interesting that the Project Gutenberg version uses a revised editon where Eggleston's Introduction and Notes explains how the book came to be, including his rationale for the language style. The fact that, by then, it was translated into French, German, and Danish is mentioned along with the difficulty of achieving anything similar in translation. "The Hoosier School-Master" was pirated with the utmost promptitude by the Messrs. Routledge, in England, for that was in the barbarous days before international copyright, when English publishers complained of the unscrupulousness of American reprinters, while they themselves pounced upon every line of American production that promised some shillings of profit. "The Hoosier School-Master" was brought out in England in a cheap, sensational form. The edition of ten thousand has long been out of print. For this large edition and for the editions issued in the British colonies and in continental Europe I have never received a penny. A great many men have made money out of the book, but my own returns have been comparatively small. For its use in serial form I received nothing beyond my salary as editor. On the copyright edition I have received the moderate royalty allowed to young authors at the outset of their work. The sale of the American edition in the first twenty years amounted to seventy thousand copies. The peculiarity of this sale is its steadiness. After twenty years, "The Hoosier School-Master" is selling at the average rate of more than three thousand copies per annum. During the last half-dozen years the popularity of the book has apparently increased, and its twentieth year closed with a sale of twenty-one hundred in six months. Only those who are familiar with the book trade and who know how brief is the life of the average novel will understand how exceptional is this long-continued popularity. For more on rural schools be sure to look at my multi-part series. While the common usage of "one-room school" is popular, a two-room school -- one for boys and one for girls -- was frequently available for those young scholars who were considered educated if they reached third or fourth grade. Of course the need for those children to help out on the farm or with younger children and household chores might make them older than our typical U.S. 8 and 9 year-olds of today. I'm writing this on the Friday before the long Memorial Day weekend, itself a subject of controversy based upon its own history. Memorial Day is the unofficial start of summer and teachers can feel their students already mentally leaving the classroom. Be sure to join a library Summer Reading program, possibly even catching my own. More children join Summer Reading programs than play Little League and it helps maintain and even improve reading skills over the summer vacation. Don't forget to check here for the many stories in the Keeping the Public in Public Domain series.